A new survey conducted by Gallup and Purdue University indicates that the type of institution that college graduates attend matters less to their future happiness at home and work than the experiences they have in college. I felt vindicated when I saw the Gallup results because I’ve been saying for years that what’s most important is not where you go to college, but whether you make the most of your time at wherever you land. It’s been a hard sell, however, and when I give presentations I can see the looks of disbelief among the parents, who believe that the most elite schools are in the best position to dispense those golden tickets to a great career and a happy life. The research, which was underwritten by the Lumina Foundation, is a nationally representative study of college graduates across the U.S. Earlier this year, Gallop surveyed nearly 30,000 adults who had completed at least a bachelor’s degree. While 63% of students had at least one professor who made them excited about learning, a depressingly low percentage of students took advantage of campus opportunities. And just 3% of students could answer yes to all six questions. While it makes no difference where you attend schools, it’s clear that most students are not taking advantage of the opportunities they have. I personally know one young person who could honestly check the box for all these questions – my daughter. Caitlin attended a school that’s in Huntingdon, PA, which is located in one of the poorest and most remote areas of Pennsylvania. 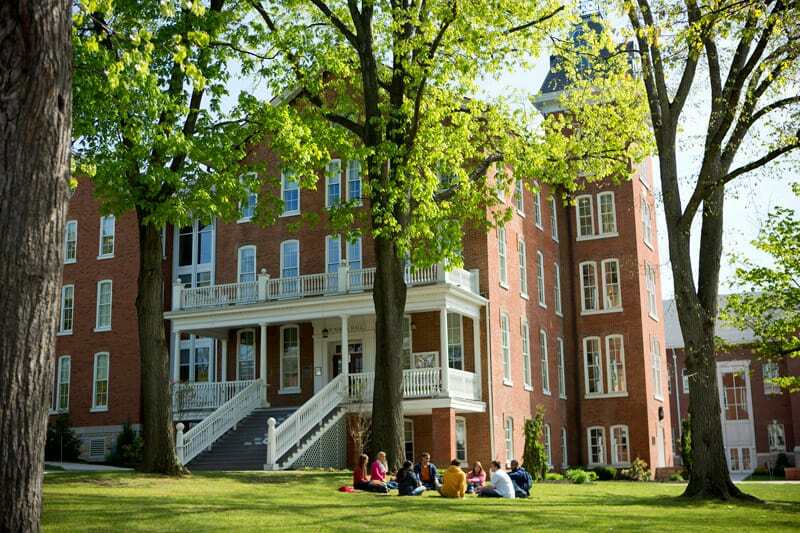 Nestled in the Appalachian Mountains, Juniata College is a 3.5 hour schelp from Pittsburgh, Baltimore, Washington DC and four hours to Philly. In other words, it’s really isolated. One of the things that attracted Caitlin to Juniata was its small-business incubator. After she had taken some business courses, she applied for and got a loan from Juniata and the state of Pennsylvania to start a picture-frame business. Caitlin conferred with professors at the school about her business plan and she asked her art professor if she could use her saws and other equipment to make the frames. The professor told Caitlin she would teach her how to use the equipment and volunteered to create a one-hour credit course for her experience. Caitlin ultimately decided that she wanted to find a source for the frames — she painted them — and a professor helped her find an inexpensive supplier in Pennsylvania. 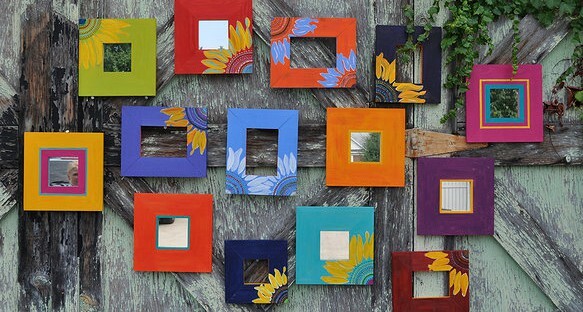 Caitlin hung some of her picture frames on an old barn door near campus for a marketing photo shoot. Juniata administrators were more than happy to allow Caitlin to sell her picture frames on campus and she enjoyed great sales during holidays. The school newspaper wrote of Caitlin’s efforts which spread the word of their availability. Caitlin ended up making enough money on her frames and arts prints (more on that later) to put a large down payment on a new Hyundai Elantra when she graduated from college and she’s since paid the car off. Caitlin was a starting forward and leading scorer on Juniata’s Div. III soccer team (she is No. 6) which was a great experience, in particular, in teaching her time management skills. She still loves soccer and now plays on two or three teams at a time back home in San Diego. Caitlin spent a summer after her freshman year living with a family and attending school in Orizaba, Mexico courtesy of Juniata. Caitlin had applied for and won the school’s scholarship for Spanish majors which included a free summer abroad experience. 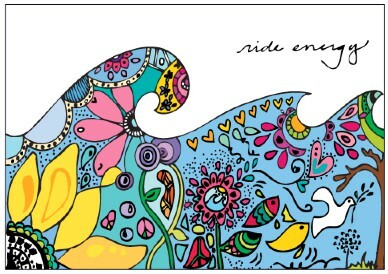 Her Spanish improved dramatically during that summer and it was in southern Mexico that she became inspired by the colorful artwork that ultimately led to her picture frames and art print business. The Spanish immersion also helped her get an internship the next summer at an institute at the University of California, San Diego. Caitlin spent her entire junior year attending the University of Barcelona. It was a crazy but amazing year as she acclimated to the Catalan culture and developed an appreciation of it. While she was in Barcelona, she wrote for her own blog and also for Juniata’s blog. Caitlin had taken a photography class at Juniata and ultimately got a part-time gig taking photos for the college. She regularly submitted entries for the school’s photo contest and won several times. 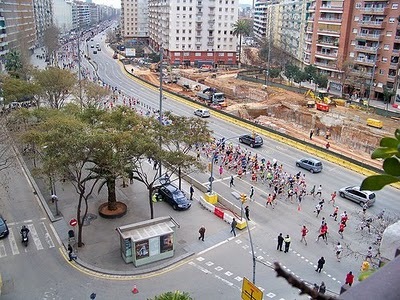 The photo above she took from her bedroom window in Barcelona as marathon runners jogged by. Caitlin, who was also an entrepreneur major, spent one summer at the Institute of the Americas at UCSD. During her time there she spoke in Spanish to Latin American visitors at conferences on the campus, served as a tour guide for the guests including trips to the San Diego Zoo and translated materials into Spanish. 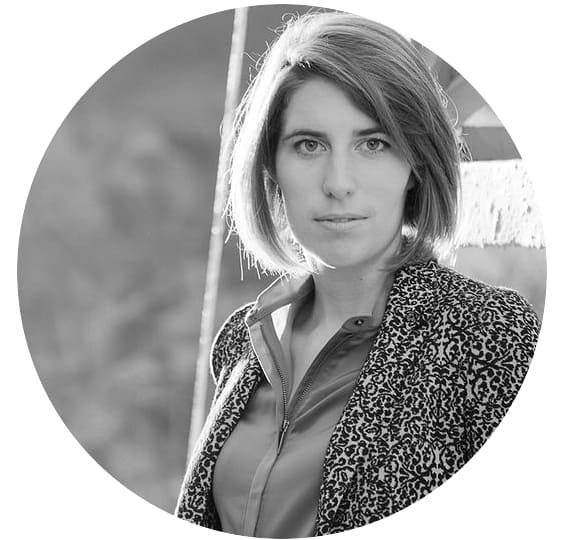 Her second internship was a direct result of her time in Barcelona. Caitlin wanted to spend her last summer at Juniata before graduating so while she was in Spain she began emailing top people she knew at the college about summer jobs. One dean who responded was the person in charge of international students. She knew Caitlin and enjoyed her frequent blog posts from Barcelona. She invited Caitlin to help her design a program to make foreign students feel welcome at the college and she spent the summer doing that. While Caitlin was at UCSD, someone in Juniata’s marketing department wanted to feature her as one of the students in its material for prospective students. He asked her to provide written answers to questions about what it was like to be a student at Juniata, which she did. The marketing folks were so impressed with her writing skills that they asked her if she would work for them after she returned from a year in Barcelona. She took the job. When Caitlin was working on her business plan, she reached out to a family friend who is the owner of Rokenbok, a toy company in San Diego. She talked with him about her plans and kept in touch and ultimately invited him to an art opening of her frames and prints at a beach coffee house in San Diego that she had arranged for her last Christmas break. He was so impressed with her work and initiative that he offered her a contract job doing social media for Rokenbok during her last semester at Juniata. After working for the company for a couple of month, the owner offered Caitlin a full-time job when she graduated. She started as a marketing associate at the company that allowed her to learn on the job. Caitlin didn’t know how to shoot videos, her photoshop skills were iffy and she didn’t know anything about creating a YouTube marketing channel, but she was eager to learn, she thought outside the box and she was creative. As a liberal arts major, Caitlin also possessed the critical thinking, communication and writing skills to succeed. People complain that liberal arts major graduate with lower salaries, but what they fail to appreciate is that they catch up just like Caitlin has. In her three years at Rokenbok, Caitlin has received many raises, bonuses and promotions. 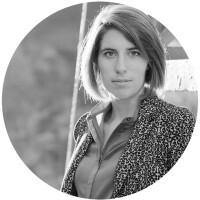 Last month Rokenbok named her director of marketing and content communications. She now hires people to do the work she used to do herself. Caitlin’s current salary exceeds what the typical American household makes. In her off hours, Caitlin remains an entrepreneur. 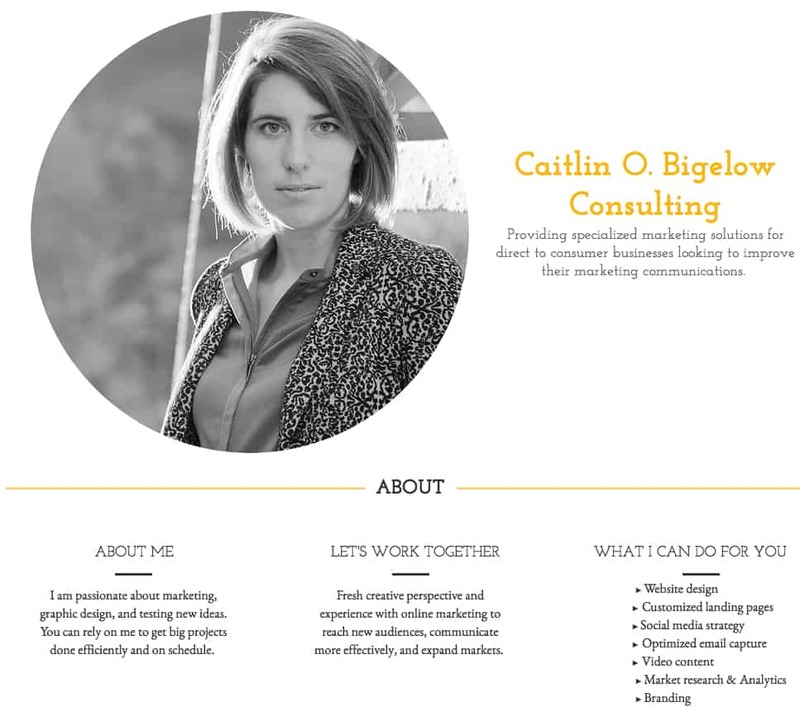 Caitlin advises small businesses on their marketing efforts and helps them improve their web presence. (I am one of her customers and I enjoy the “mom” rate.) She has gotten businesses through referrals and also networking. One of her clients is a start-up whose CEO she met at a tech networking event. The CEO was so pleased with Caitlin’s work that he recently offered her a job with stock options, but she’s happy at Rokenbok. There are many paths that can lead to success in life and a career and my daughter picked the path (a liberal arts college) that few choose. Like the Gallup research suggests, a student can experience success after graduating from any college or university and I agree, but I think it’s easier for a child at a college where the undergraduate experience is the No. 1 PRIORITY. This is definitely not the case at research universities. What you also don’t have to be is a 4.0 student! Caitlin, who has the best social IQ of any young person I know, didn’t graduate from college with honors. And while parents and students obsess about grades, GPAs aren’t going to be of any use — thank goodness – in careers. Employers want to know what you can do for them not what your transcript looks like. When Caitlin was a senior, Juniata’s president, who was big supporter of Caitlin’s, told me that my daughter had squeezed the absolute most out of her liberal arts education. I obviously agree and I couldn’t be prouder. Thanks for your lovely note Amanda! I am glad my post gave you ammunition for why a liberals arts education can be a wonderful way to get a bachelor’s degree. My son, who is three years younger than my daughter, also went to a liberal arts college – Beloit College – and also had a fantastic experience and found a good-paying job! We’re doing some deep thinking about our kids’ high school schedules and goals and beyond. This backs up some thoughts I’ve had after reading several books, including World Class Learners, but since I was raised in the tradition of the killer schedule and top GPA, it’s hard to feel confident in another path. Thanks for sharing this. There is a “fine line” between true information and bragging!. You didn’t do the latter. I am sharing this with my son, and other prospective students. It gives them a real world (both college and life) example of what they can do with college opportunities and the overlap to a career. Thank you for sharing Caitlin’s story! It is so inspirational. It really hits home for me with my oldest daughter and gives me hope that she is on the right track. She is just completing her freshman year, is planning to double major, and has declared one of the two majors – individualized major in art history and museum studies. Many people roll their eyes when I tell them that and comment something to the effect of “good luck making a living with that!” I refuse to believe that declaring such a major will pigeon-hole her. There are so many possibilities. She is developing great writing and critical thinking skills at school and she is already investigating internships and study abroad opportunities. In addition, she is learning discipline and time management as a member of the cross country and track teams. Getting a couple great professors second semester was what got her on the right track towards planning for her future, just like the Gallup results showed. I agree that college is really about what you make of it and not whether your school is #1, #100 or #300 on someone’s ranking list. The best plan is to get a great deal on an education and then take advantage of every opportunity that comes along to learn new things and gain valuable experience.